Docentric AX is Microsoft Dynamics 365 for Finance and Operations Enterprise Reporting Solution. 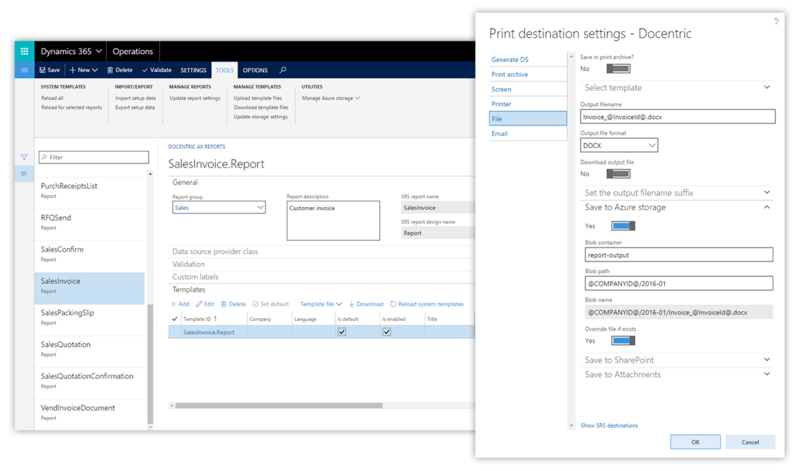 Improve print destinations (Email, File, Screen, Print Archive) for all SSRS reports – for free! Create new custom reports beyond compare. Docentric designs for commonly used reports such as Customer Invoice and Purchase Order are provided out-of-the-box. Design labels with 1D and 2D barcodes. Automate reports you usually leave behind such as Contracts, Product Catalog Sheets and HR Documents. Update report designs at production time. Use multiple designs without coding. Use MS Word as report designer. Suitable also for functional consultants and end-users. Superior support for multilingual reports. Contains VS templates for Docentric DSP classes. Add additional data to existing SSRS reports, without changing built-in report artifacts such as RDP (Report Data Provider) classes, tables or queries. You will be able to accomplish this much easier than using extensions. Create a new custom SSRS report, without using RDP classes or tables. You can add data from arbitrary AX tables and views, or any other internal or external data source, using plain X++. Data can be calculated and shaped into meaningful groups and hierarchies. Manage custom placeholders used in Docentric print destinations. Dynamically change print destination settings, e.g. to select different template, or to add additional email attachments. Each of the VS templates creates a new class that extends the Docentric base DSP class (or so called Default DSP class), but with different overridden methods, TODO tasks and useful comments, depending on the use case you currently have.